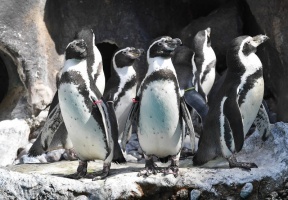 Penguin lovers can waddle their way to Brookfield Zoo on Saturday, April 21, and join in the World Penguin Day celebration. 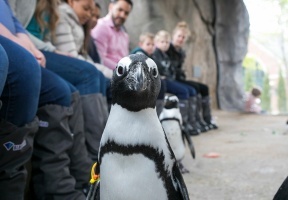 Activities for the entire family will be taking place between 10:00 a.m. and 3:00 p.m.—both inside and outside The Living Coast exhibit, which is home to the zoo’s Humboldt penguins. The first 1,000 youngsters to join the festivities will receive a commemorative World Penguin Day wristband. The bands are the same colors as those on the zoo’s penguins, and are how the animal care staff identify each individual bird. Kids can check out the ID guide posted in The Living Coast’s Rocky Shores’ habitat to determine which penguin is wearing the same color band as theirs. World Penguin Day activities are free with zoo admission of $21.95 for adults and $15.95 for children 3 to 11 and seniors 65 and over. Children 2 and under are admitted free. Parking is $14. Brookfield Zoo is located at 8400 31st Street in Brookfield. For more information about World Penguin Day at Brookfield Zoo, visit CZS.org/Events or call (708) 688-8000. © 1376 Chicago Hispanic Newspaper, Lawndale News, Hispanic Bilingual Newspapers, Su Noticiero Bilingue. All rights reserved. XHTML / CSS Valid.